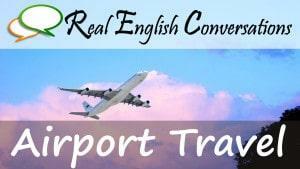 Take a trip with us and explore a Real English Conversation. Amy and Curtis talk about traveling through airports with people who speak a different language than them. Hear about some of the experiences where it was really helpful to know a basic level of another language while traveling and communicating important information. Check out a preview of the English Podcast transcription and audio player near the bottom of this page.